The New Yorker had many generations, even during the time frame presented on this site. The ’73s were the last of the generation that was around since 1969. These had only the 440 V8. New Yorkers were redesigned for 1974, which might have made them look a little more like a big GM car. This style lasted until the 1975 model year, ayleast on the New Yorker Brougham. The NYer Brougham inherited hideaway headlights for ’76 but was just as tank-like as the generation before. Extra large all the way up until 1978, these cars were truly the last of the holdouts. Engine for this generation were the 400 and 440 big blocks. For 1979-1981 while still big, the New Yorkers were trimmed down and became ‘metrics’. This was the new R-body platform which was loosely based on the old B-body platform. Still having hideaway headlamps, the big blocks were long gone, buyers were relegated to the 318/360 V8s. There was a one-year only generation of New Yorker and that model year was 1982. Hideaway headlamps were gone. 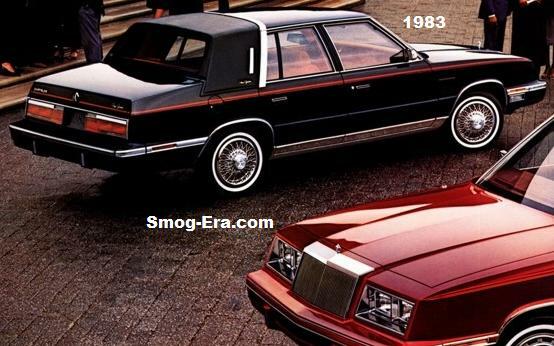 Essentially a stop-gap measure, this car was based on the M-body Dodge Diplomat, and sported the same 318 V8. 1983 was the start of the front wheel drive New Yorkers. This car was yet another variant of Chrysler Corporation’s savior, the K-car. While the only engines for this generation were 4 cylinders, you can’t get any more ‘stereotypical 80s’ than the digital dash cluster and ‘Voice Alert’ feature. On another note, these cars rode as smooth if not better than the rear wheel drive ancestors.